Alpana hotel in Haridwar is a 3 star property situated very close to the bathing ghat that is Har-Ki-Pauri. The best thing about this hotel in Haridwar is that you will get a complete feeling of being in Haridwar the holy city. All places of religious interest are close to Alpana Haridwar hotel. The experience of being in Haridwar comes only when one stays within walking distance of the Ghat. Hotel Alpana has the basic amenities/facilities/services are good and makes you feel as staying in a homely and comforting atmosphere. Excellent location for old people family people, foreigners, press, journalist and photographers. The hotel is located at Ram Ghat, 500 meters from Har-Ki-Pauri Ghat (main bathing ghat where evening arti is performed everyday ) behind Haveli Hari Ganga and around 100 meters from Ganges. The hotel is centrally located and the distance from the railway station is 1.3 kilometers or just 10 minutes ride on a rickshaw. Alpana hotel in Haridwar is situated inside the main market, the advantage is to shop locally for clothes, god and godesses statues big and small, article items and object of god and godesss. Food eatries such as Mathurawala, Brajwasi are within walking distance and on way to Har-Ki-Pauri. The rooms in Alpana Hotel are good and hotel is centrally air conditioned, with restaurant, two lifts, good furnishings, parking space inside and incase of parking outside the parking space is located 200 to 300 meters from the hotel at Ram Lila ground parking. 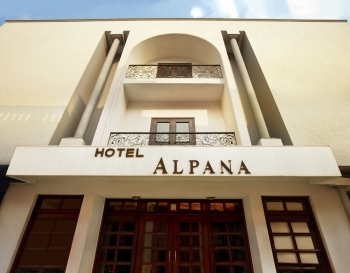 The Alpana hotel is centrally located and all places of intrest ar nearby. Executive Rooms (2): The best room in the hotel well furnishes tasteful furniture. The rooms are comparable to the best rooms in haridwar. The rooms have ample space and amenities like AC, TV, minibar, telephone. Deluxe Room (2) : The has a good furnishing clean decor with room amenities like AC, TV, minibar, telephone. Standard Rooms (15) : The best room in haridwar at this price with room amenities like AC, TV, telephone. The hotel Alpana have a multi-cuisine restaurant. 1) First way to reach the Alpana hotel :- Shankracharya Chowk (1 Kilometer before Zero Milestone > Dam Kothi > Cross the bridge over Ganges > The road leads to Railway station > Ram Lila Ground Parking > Ram Ghat. 2) Second way to reach Alpana hotel :- Delhi > Haridwar Zero Milestone > Circle Chandi Devi > Turn left and cross the bridge > First right turn after the bridge > 20 meters turn right parallel to ganges > reach Birla Dharamshala > move forward to Ram ghat. 3) Haridwar Railway station > Turn left on exit> hire rickshaw (20 rupees) > Ram Lila Ground Parking > Ram Ghat.